For a multitude of reasons I won’t bore you with, the last few weeks have slipped into hyper-drive, making it difficult for me to sit down and write a proper posting, much less get home in time to turn on the oven. My hope is that in the coming days there will be some sort of planetary realignment and I’ll begin to see a few rays of light peeking through my over-committed days. Because it sure would be nice to get back to doing some serious cooking! And the good news is that I’m finally off the crutches, which means moving around the kitchen is doable again. In the meantime, please continue to bear with me as I scramble to meet my various deadlines, self-imposed and otherwise. And please know that if I fail to make an appearance now and then (as I did last week… sorry!) it’s not for waning interest or a lack of trying. There just don’t seem to be enough hours in the day at the moment. 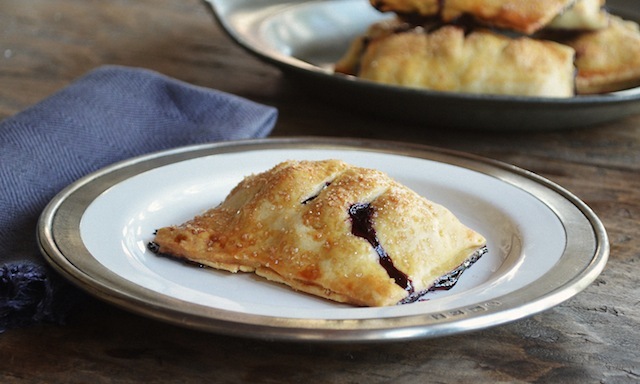 In any case, this week I’ve come offering blueberry hand pies, which should make up for any recent lapses in scheduling (not that I’m trying to bribe you or anything). 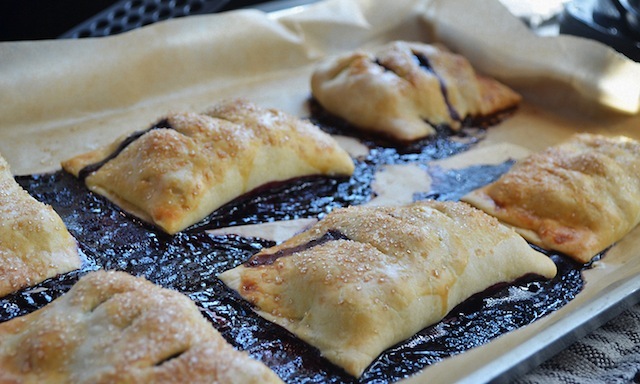 I pulled the recipe from the July issue of Bon Appétit, in part because I was overdue to get my hands into a bowl of blueberries, but also because I found the self-contained nature of this dessert irresistible, much the way I do an empanada. Because of their size and easy to grab nature the magazine suggests these as a kid-friendly dessert, and while I’m sure that’s an accurate description (they’re reminiscent of those Hostess fruit pies I always hoped my mom would slip into my lunchbox and never did), I can’t imagine an adult who wouldn’t be just as delighted by them. And if that happens to occur at a picnic (for which they’re ideally suited, naturally) all the better. Still, I wouldn’t limit your enjoyment of these little pies to those occasions when you plan to forgo cutlery. In fact, they may even be better when accompanied by a scoop of vanilla ice cream and few spoonfuls of berry sauce (my addition, not the magazine’s). The blueberry sauce can be assembled easily enough by using the same proportions of berries, sugar, lemon zest, and lemon juice listed in the filling recipe, then warming it over medium heat until the berries begin to break down and become syrup-like (about five minutes or so; precise ingredients and instructions are listed below). 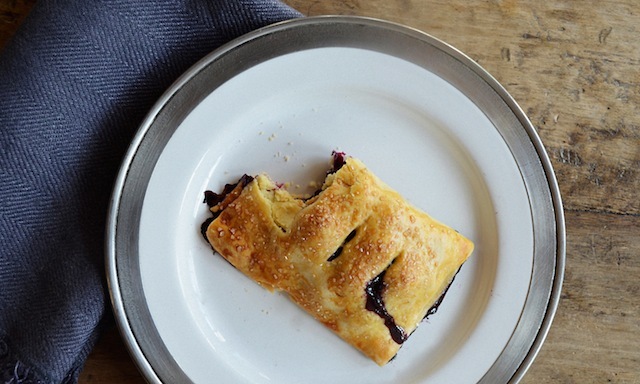 In addition to looking delectable on the plate, this slight modification also has the benefit of offering a little more fruit and berry syrup to balance out the pastry dough—something I found myself wishing for as I bit into the drier edges of the pie. What’s more, that berry/sugar/lemon combination makes for one of the best blueberry fillings I’ve ever tasted, so if you’re like me you’ll want to make sure you have plenty to go around. That said, one reason I experienced a berry shortage may have been the fact that I was using particularly large blueberries—a reality that limited the number I could fit into the center of each pie. (Since the recipe calls for folding the pastry dough over the berries, too large a mound can cause the dough to tear—a discovery that caused me to be a little more parsimonious with my berry allocation than I might have been otherwise). So use smaller berries if you can find them and avoid this problem altogether. And one other piece of advice: although the recipe calls for a baking time of between 35 and 40 minutes, I found more like 50 minutes was required to achieve the desired golden brown exterior. That color is key to achieving both the look and consistency critical to this dish’s success, so definitely keep an eye on the oven once you reach the final minutes of baking time. With or without the sauce and ice cream addition, however, and regardless of the size of berries you use, what you can count on here is a wonderful berry filling infused with lemon, and wrapped by a buttery, flaky crust. In a word: delicious. Who says you can’t grab ahold of summer? —Preheat oven to 375˚. 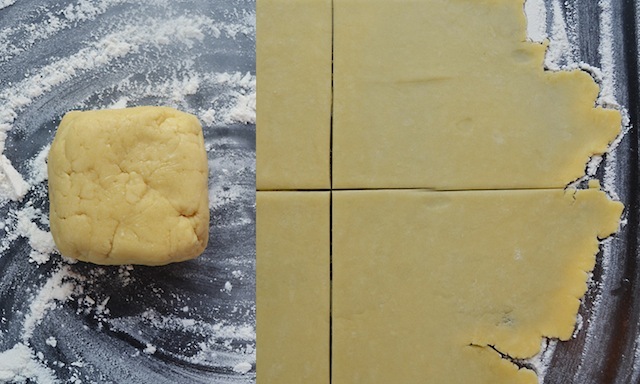 Roll out dough on a floured surface to a 15 x 12-inch rectangle. 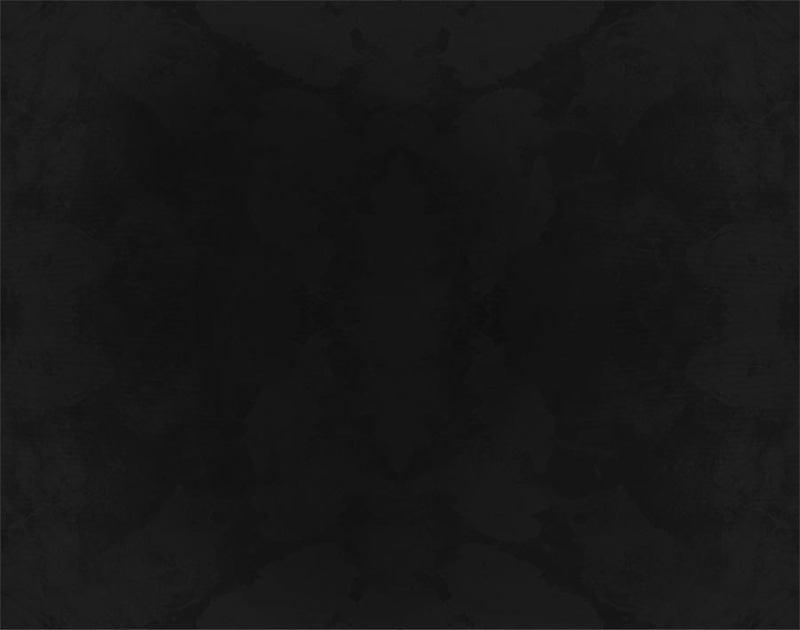 Cut into six rectangles. 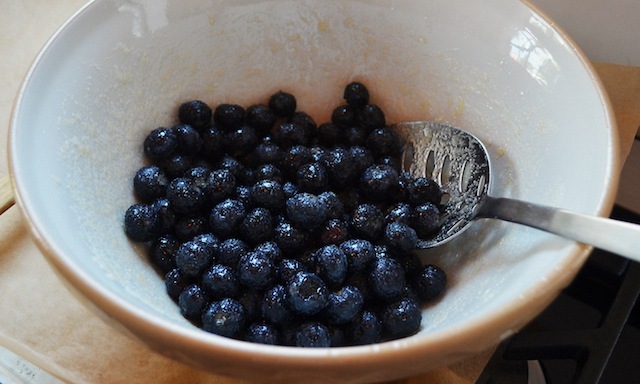 —Toss blueberries, lemon zest, lemon juice, sugar, and salt in a medium bowl. 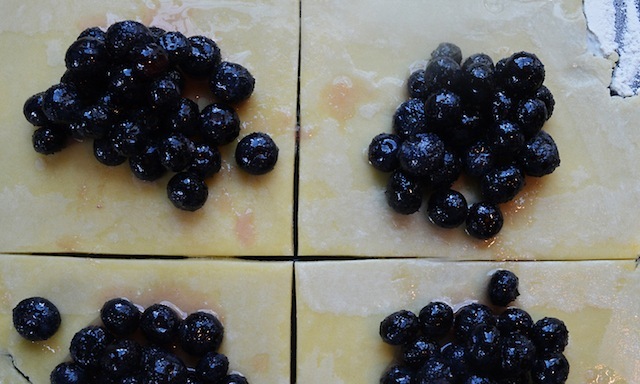 Brush edges of rectangles with water; mound some blueberries in center of each. Fold dough over and press edges to seal. 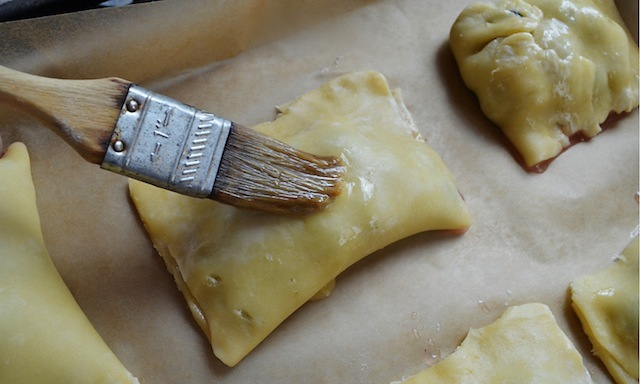 Place on a parchment-lined baking sheet, brush with egg wash, and sprinkle with raw sugar. Cut three to four slits across the tops. —Transfer to a wire rack. Serve warm or at room temperature. —Pulse flour, sugar, and salt in a food processor. 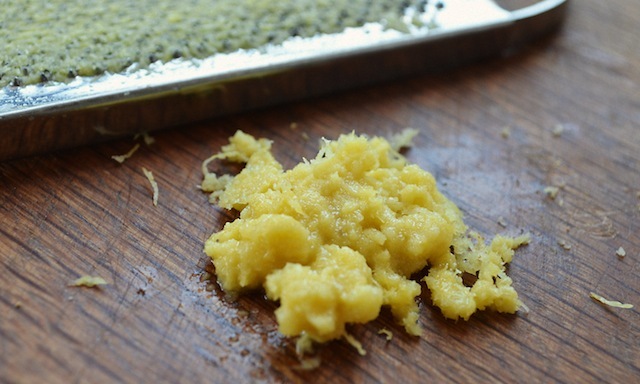 Add butter; pulse until the texture of very coarse meal. 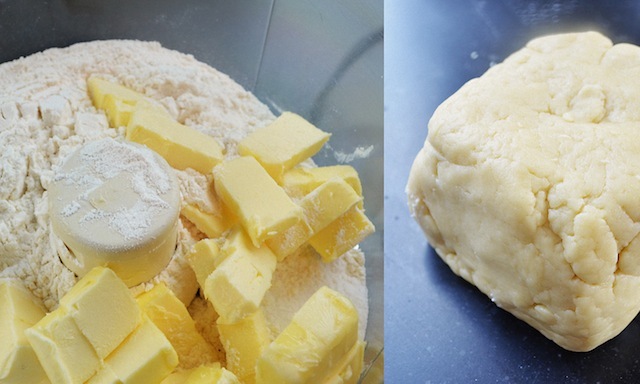 Add ¼ cup ice water; pulse, adding more water if dry, until dough comes together in clumps. —Form into a square, wrap in plastic, and chill until firm, about 2 hours. —Note: Crust can be made 3 days ahead. Keep chilled. Let stand at room temperature 15 minutes before rolling out. 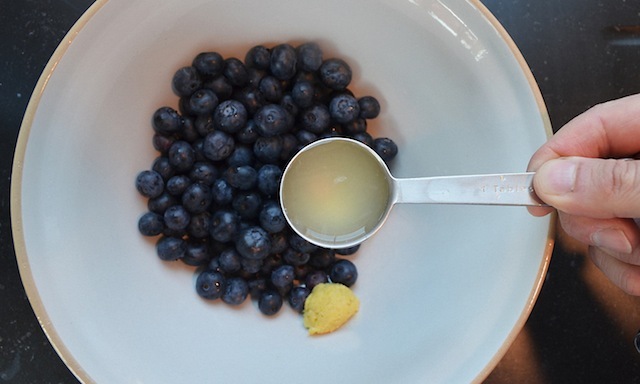 —Toss blueberries, lemon zest, lemon juice, sugar, and salt in a medium bowl. —Place in a small sauce pan and heat over medium heat, until berries break down and become syrupy, about 5 minutes.